One cannot discuss Mr. Ho’s Orchestrotica without first discussing Juan García Esquivel. More popularly known as “Esquivel” or “The King of Space Age Pop,” he got his start piano playing for a Mexican radio station when he was only eleven years old! Six years later, he was a popular bandleader in charge of a large orchestra. It wasn’t long before an American record label took notice of this and worked out a deal with him. The timing could not have been more perfect, as stereo recordings had just started to become widely available to consumers. Esquivel took advantage of the format to spectacular effect, especially given his use of big band sound and exotic instrumentation. Although (understandably) known as “The King of Space Age Pop,” he also drew upon Mexican and Latin influences in his music. Esquivel believed that one has to grab the audience’s attention in order to charm him, which meant that he had to seek out a variety of interesting sounds. He likened his work to an artist painting, with music being like his paint. The subject of today’s review, Third River Rangoon, was released a year after their debut album, The Unforgettable Sounds of Esquivel in 2010. According to the liner notes for the subject of today’s review, O’Neil was not a big fan of traditional exotica when he first heard it, but came to love how it lets one “escape” and experience exotic locales. 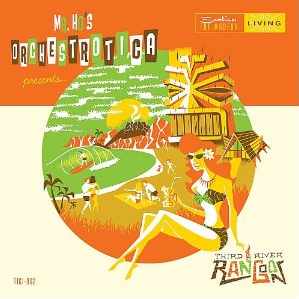 Mr. Ho’s Orchestrotica offers its own unique brand of “third-stream exotica,” which keeps the escapism while also allowing them to seek out musical influences that are different from that of traditional exotica. The opening track, “Third River Rangoon” uses an incredible array of instruments to create a very soothing, laid back feel with a hint of mystery. The vibe and flute work really shine here. “Thor’s Arrival” plays tribute to Thor Heyerdahl’s famed Kon Tiki expedition by musically conveying both the experience of an explorer arriving in mysterious land and a sense of exploration. As the vibes and percussion blend with bird calls, a mix of both leisure and majesty is also felt. In this strange land, wonders (and not horrors) await. Next is an amazing take on Milt Raskin’s “Maika,” whose flute work, soft chimes and other percussion make for a very relaxing experience. The Orchestrotica’s take on Cal Tjader’s “Colorado Waltz” shakes you out of slumber without being too jarring thanks to its medium pace and amazing vibe work. Their take on Tchaikovsky’s “Arab Dance” brought back many memories of The Nutcracker. It’s a slow, exotic (but faithful) take on classic where both the flute and exotic string work excel. It’s the perfect way to spice up the playlist at your next Christmas party. “Phoenix, Goodbye” features both an unusual instrument in its introduction and equally unusual percussion throughout the rest of the track. It’s unlike anything I’ve ever encountered, and I mean that in a good way. “Terre Exotique” uses exotic percussion coupled with great string work and vibes to great effect, while “Autumn Digging Dance” features Tev Stevig on the oud. The oud, along with the occasional chimes and cymbals add to its Middle Eastern feel. Listeners of our podcast should recognize “Moai Thief” and its sense of magic and mystery. Its musical variations convey sneaking, while the drums make one think of islanders. Sharp-eared listeners will also note a Dmitri Shostakovich influence. Living in Massachusetts, I have a very special fondness for “Lonesome Aku of Alewife.” Remember back when I commented on how the Ding Dong Devils song “Ballad of a Taboo Image” reminded me of a local event. Well, what I (and this track) are referring to is the closing of the beloved Polynesian restaurant “Aku Aku” in Alewife. I cannot tell you how many times I passed by its rotating sign featuring Moai artwork during my travels through the area over the years. I, like so many others, were distraught upon the news of Aku Aku’s closure. Adding to the distress was the fact that not only were the twin moais at the entrance local icons, but they had been previously rescued from the closing of the Polynesian Village restaurant in Boston! When Jasper White’s Summer Shack moved in, they kept one of the moais and repainted and reworked it into a giant fisherman. The Summer Shack also kept the Buddha statue by the entrance and still has the scorpion bowl on their menu (whose entry mentions Aku Aku by name). In the track itself, the bass and percussion work well with the guiros and vibes, which later transitions to an amazing bass solo. Things close out with “Lyman ’59,” which perfectly captures the essence of Arthur Lyman’s work (especially his work on the Bwana á and Bahia albums. Vibes carry us through a musical journey with dreamy flute work, magical chimes and soft animal calls in distance. In short, a great ending to a great album. As a special bonus, look for the essay by Brother Cleve (of Combustible Edison fame) hidden under the CD. Speaking of bonuses, you can download the above streaming track (along with some other selections from the album) by clicking here. Enjoy! Special thanks to Mr. Ho’s Orchestrotica for the review copy!